Comfortable 3 bedrooms apartment can be found in tiny pitoresque village called Skitaca, near Sajini. Green surrounding of the inland Istria makes this apartment nice holiday choice for relaxing peacefull holiday. Apartment covers 120 m2 of the family house first floor, while the owners live on the ground floor. There are around 40 locals living in this charming cozy village. Well equiped apartment with plenty of space will meet the requests of the bigger family or smaller groups of friends. To make your stay complete, the garden area with bbq and sitting furniture is on your disposal. The quick refreshment can be found in the above-ground removable swimming pool. Fenced garden for your privacy and safety. Parking on the property. The busy summer streets, colourfull restaurants and open air activities can be reached within 15 minutes drive in the city of Pula. Culture lovers can attend concerts, festivals, city fairs... families can enjoy walking through the vivid streets or visit various souvenir shops. 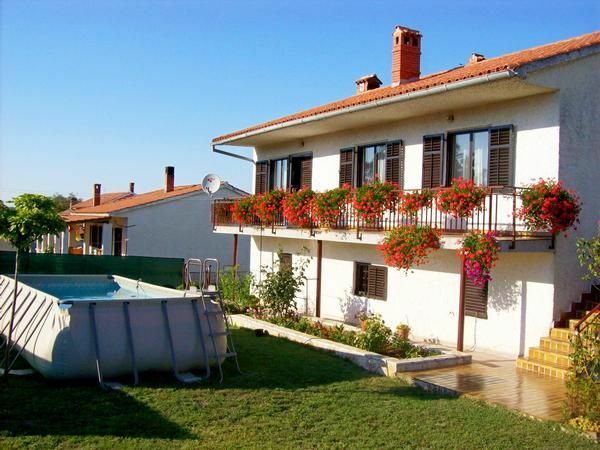 The house is nice stating point for daily visit to magnificant medevial Istrian places, children aqua park or nice beaches.